Impact of reduced salt consumption on dietary intake of iodine. Daily consumption of salt fortified with iodine is a proven effective strategy for prevention of IDD as reported in numerous scientific studies. Furthermore UNICEF and GAIN (The Global Alliance for Improved Nutrition), promote salt iodisation as it is the easiest and most effective way to secure iodine supply to the population. However, elevated sodium intake has been associated with a number of non-communicable diseases, (including hypertension, cardiovascular disease and strokes), and decreasing sodium intake may reduce blood pressure and the risk of associated health problems. The balance between fortifying salt with iodine and reducing total salt intake may swing to lowering iodine intake below the recommended levels. The global trend to reduce sodium intake may require an increase in the amount of iodine added to salt in order to make up the difference. In addition iodisation of low sodium salt and other salt replacers is important to secure an adequate iodine intake. This requires an active role of governmental organisation and food industry to monitor and eventually adapt the required salt iodisation in every country. If this is done in a pro-active way it can remove the potential conflict between the two mayor health issues, reducing sodium intake and securing an adequate iodine intake. The importance of iodine in human nutrition. Iodine is an indispensable trace element in the diet of all vertebrates, as it is essential for the synthesis of thyroid hormones. It is readily taken up from food and accumulated in the thyroid gland: an adult human body contains a stock of about 20 mg of iodine. Iodine deficiency occurs when the soil is poor in iodine, causing a low concentration in food products and insufficient iodine intake from the diet. When the iodine content in the daily diet is not sufficient, the thyroid stock will be depleted, leading to thyroid dysfunction. The term “Iodine Deficiency Disorders” (IDD) covers all effects of iodine deficiency on physiology and development of individuals. IDD are one of the biggest worldwide public health problems of today. The World Health Organization (WHO) estimates that approximately 37% of school-age children, 285 million, and nearly 2 billion individuals worldwide, do not take in sufficient amounts of iodine with their daily diet. Chronic iodine deficiency causes the thyroid to work much harder to absorb small amounts of available iodine. This results in swelling, known as goitre or struma. During pregnancy, the need for iodine in women is increased, to enable sufficient provision of thyroid hormone to the developing embryo, iodine deficiency can cause stillbirth, spontaneous abortion, and congenital brain abnormalities that may lead to irreversible and severe mental impairment. Iodine deficiency is a global public health problem and the world’s most common cause of preventable brain damage or mental retardation in new-borns and infants. Goitre is just the visible tip of the iceberg. The “hidden” effects are much more life-limiting and severe. The impact of iodine deficiency lasts a lifetime. It limits a child’s ability to learn, earn a living, and live a healthy life. These debilitating consequences are often felt by the whole community: a chronic problem can decrease the average IQ by as much as 13 points. Consistent consumption of small quantities of iodine can prevent IDD and reverse some, but not all, of the negative effects of iodine deficiency. 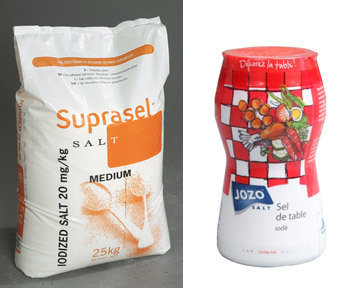 In the United States and Europe, salt manufacturers have been adding iodine to table salt and salt for use in food applications since the 1920. Nowadays, more than 70 countries support salt iodisation programs, although salt iodisation often is still a voluntary program. Iodised salt is used as table salt and for food preservation, and its use in bread production is one of the oldest, widely known, applications of iodised salt. As a result of the salt-iodisation programmes, approximately 70% of households worldwide use iodised salt, ranging from almost 90% of households in North and South America to less than 50% in Europe and the Eastern Mediterranean regions. To reduce consequences of a high sodium intake on health problems associated with a high blood pressure, health professionals are advocating to reduce sodium intake, and WHO has adapted it’s guidelines in 2012, based on a review of the currently available research. In Europe salt consumption has already decreased in the past 50 years to a current average of 8–12 g per day. In its 66Th World Health Assembly, the WHO set the goal for global reduction in dietary salt intake by 30% in 2025. The target value is reduced to no more than 2 g sodium (Na) ~ 5 g salt (NaCl)/day, which will likely result in a drop in the overall salt content in food. In countries that rely on iodised salt to supplement iodine deficiency in the diet, the reduction of salt will affect the daily intake of iodine. For instance there are conflicting aspects when on the on hand, bakers are encourage to reduce the quantity of salt in their products while on the other hand bakers are asked to replace regular salt with iodised salt in the baking of bread in order to increase daily iodine supply via bread. The table below shows how a reduction of salt used in baking, may reduce the amount of iodine consumption from bread by 50%. Iodine per slice of bread by iodised salt content of the flour. Considering both the existing WHO policies about reducing the intake of salt and delivering adequate dietary iodine to populations, the World Health Organisation addressed this issue in 2014, providing a guideline  by suggesting the average recommended amount of iodine to add to salt, relative to an average daily salt consumption. These recommendations recognize that salt reduction and salt iodisation are compatible. Monitoring of salt intake and salt iodisation at country level will be needed to adjust salt iodisation over time as necessary, depending on observed salt intake in the population. Suggested concentrations for the fortification of food-grade salt with iodine. *This includes consumption as table salt as well as salt from processed foods. There is an alternative way to realize a reduction of sodium intake without increasing the amount of iodine in salt. The effect of reducing salt (NaCl) consumption on prevention of hypertension is a consequence of lowering sodium (Na) intake. Complete or partial replacement of NaCl by a low sodium salt will reduce sodium intake. However most of these low sodium salts are non-iodised. The challenge for development of low sodium salts has been taste; mostly a low sodium salt has a bitter taste due to replacer of sodium chloride. 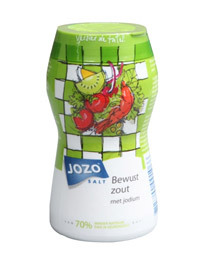 However, at this moment low sodium salts are available that are suitable for household and industrial applications and can facilitate the reduction of sodium in food without affecting the other functions of salt: taste and being the ideal carrier for iodine. This new generation of low sodium salts tastes nearly the same as sodium chloride Especially the iodisation of low sodium salts used in prepared foods is important, since in industrialized countries about 75% of sodium in the diet comes from manufactured foods and foods eaten away from home.